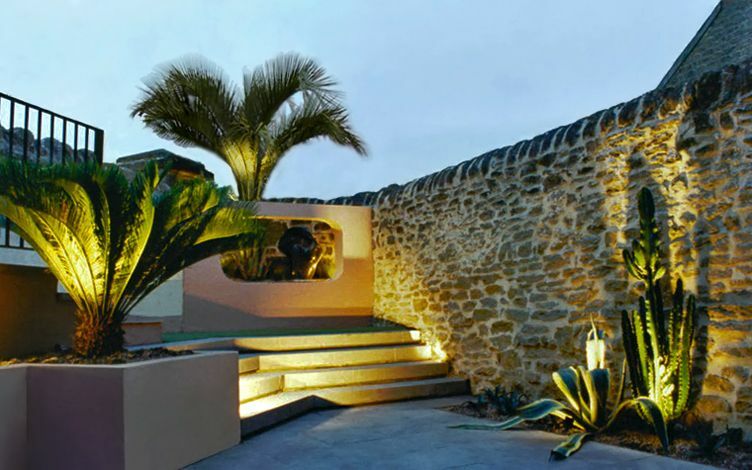 This courtyard garden forms a triangular outline within textured perimeter stone walls, where its contemporary design narrates an outdoor sequence via a 20-step stairway into an architectural seaside setting. 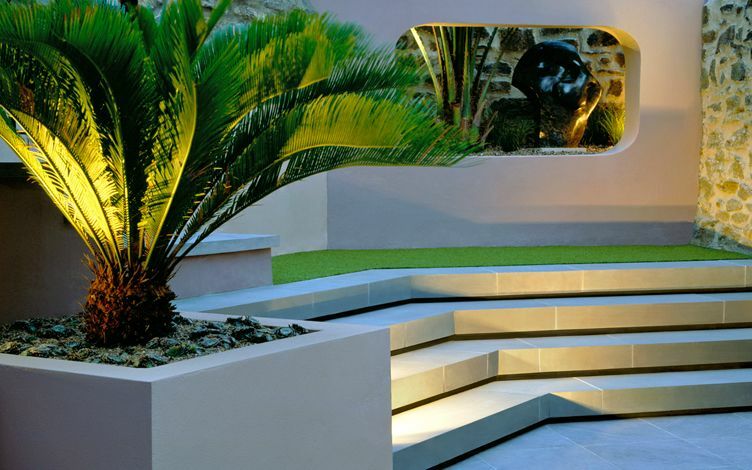 Spatial clarity is defined by tall Palm trees displayed along 3-metre-high walls, enhancing pivotal scale. 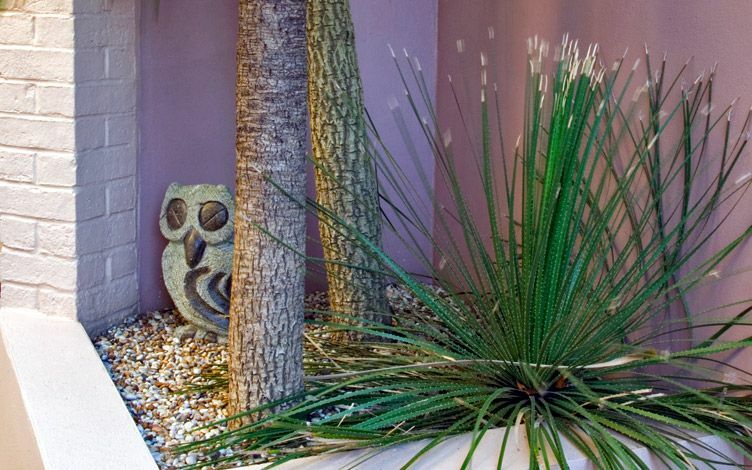 The varying design angles and three-dimensional qualities of sculptural plants amplify a unique, all-year-round space, amid a meticulously detailed courtyard design. 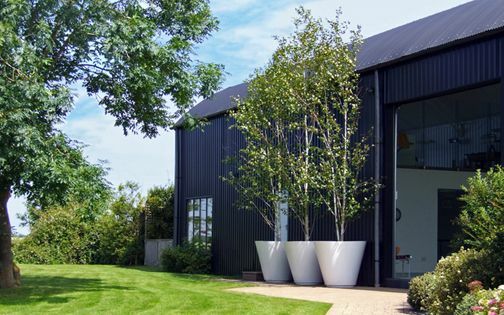 This unique courtyard garden features peaceful Dorset countryside views, in a bona fide summertime suntrap, and with a truly inspiring location, a warm climate and intriguing level changes, the stage was set for detail design in abundance. 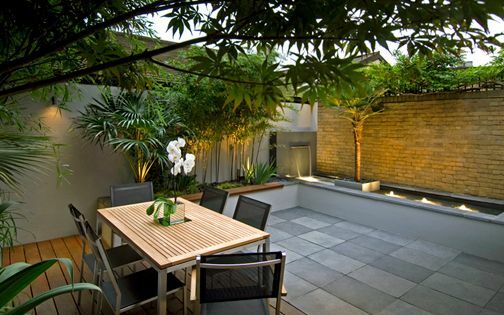 The courtyard's history is steeped in local folklore, enabling us to create a garden outside London and engage in unfamiliar site conditions, remarkable light quality, as well as an intriguing breadth of natural stone finishes, while developing original courtyard garden ideas with an architect client. 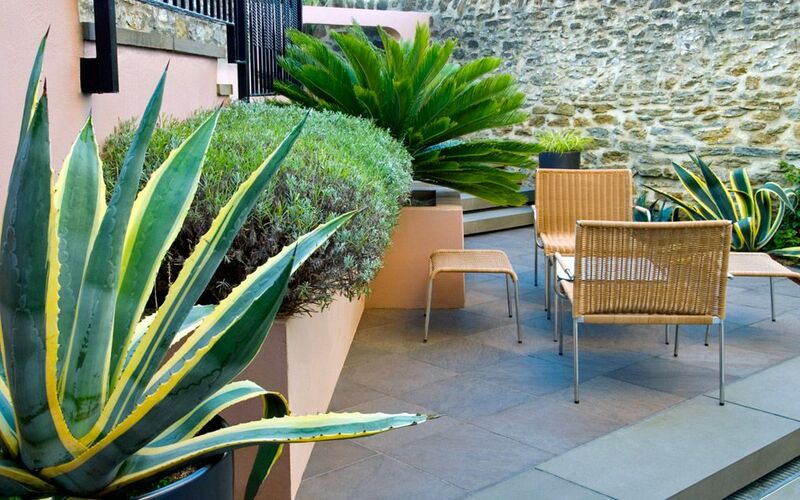 Enclosed by 3-metre-high boundary walls, this centuries-old courtyard delineates a robust, compositional garden design – infused with contemporary elements amid a low upkeep ideology, within a coastal setting. 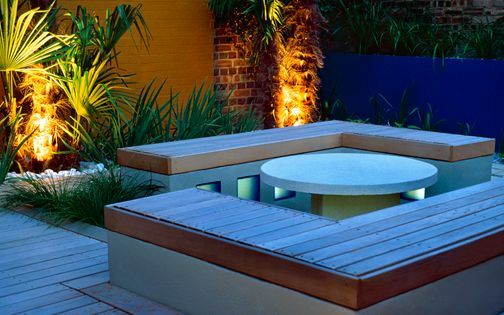 The courtyard previously formed an unused outdoor space within a home development, presenting a promising blank canvas. 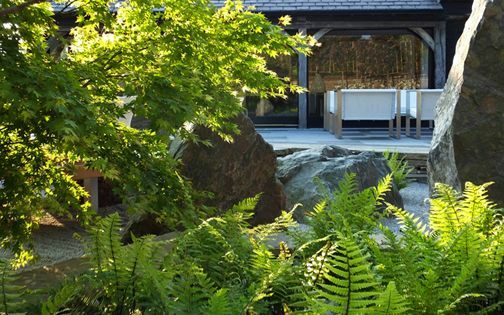 Mitigating a challenging, triangular courtyard outline, the garden design's paved surfaces, angular steps and sculptural focal points produce dynamic transitions, where each elevation conveys a distinctive backdrop. 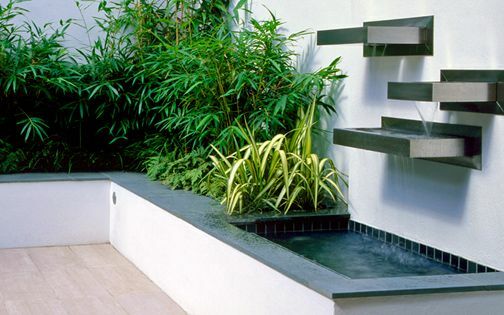 The upper entrance leads down via a 20-step stairway, demarcated with a tall Palm tree canopy which reaches the top level, enhancing tactility and scale by bolstering a multilayered architectural courtyard garden design. 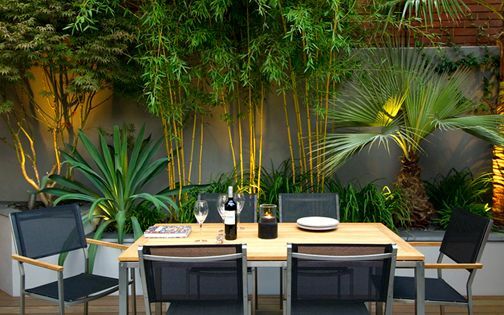 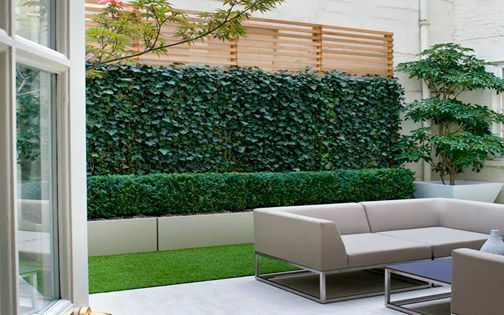 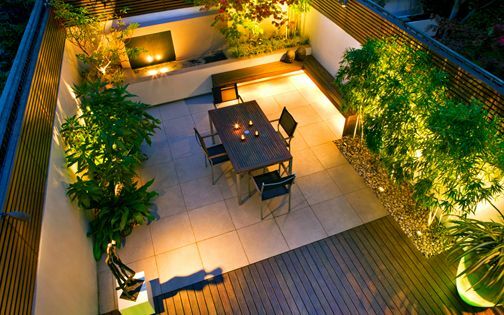 This two-tiered composition seamlessly links the contiguous spaces through contrasting textures and expressive outdoor lighting. 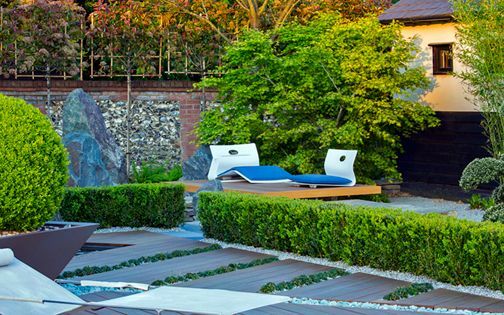 The new, smooth sandstone contrasts its old textured courtyard walls within a refined detail design palette, where a contemporary garden approach is augmented by a touch of artificial grass in the mezzanine landing – symbolic of nearby verdant Dorset hills. 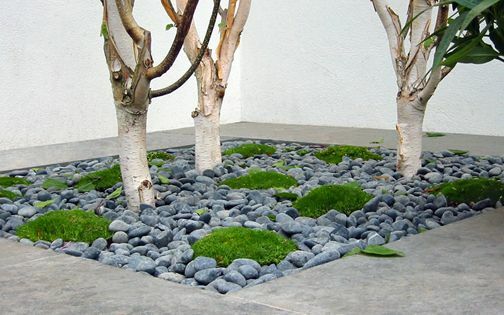 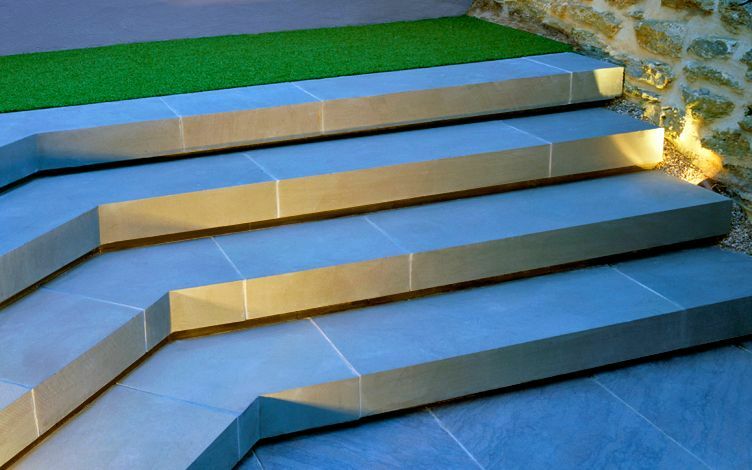 The grey sandstone forming the continuous step treads was quarried at 110mm height to define minimalist garden nuances, delineated further with a shadow gap below. 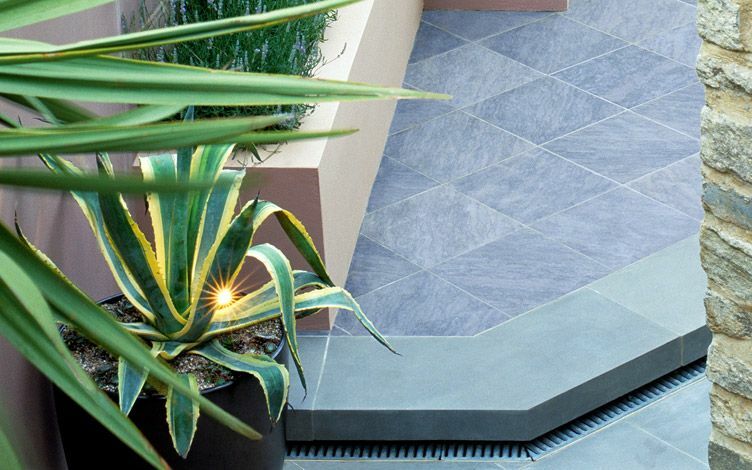 The courtyard's main lounge is surfaced in purple-brown sandstone paving which displays subtle veining, where its light violet spectrum portrays hard landscaping fluidity to contrast a silky grey continuum. 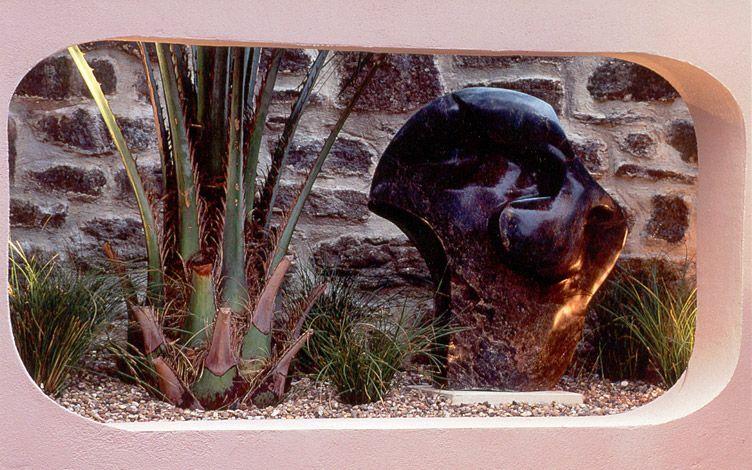 Jelly palm fronds arch above an abstract African artwork at the courtyard's apex, producing a feathery, embracive canopy. 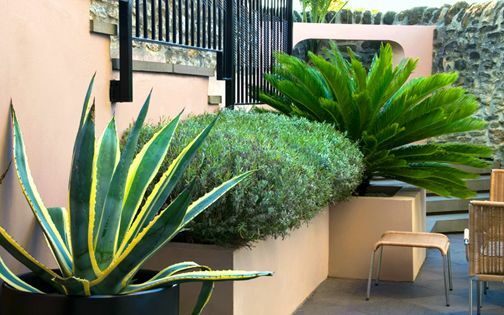 The deep courtyard stone walls continually absorb and retain heat, sustaining a spectrum of tender plants, and enveloping a large Cycad specimen centrepiece. 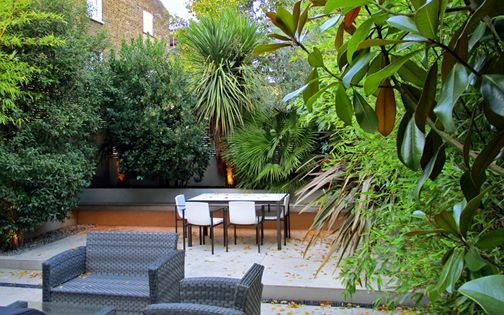 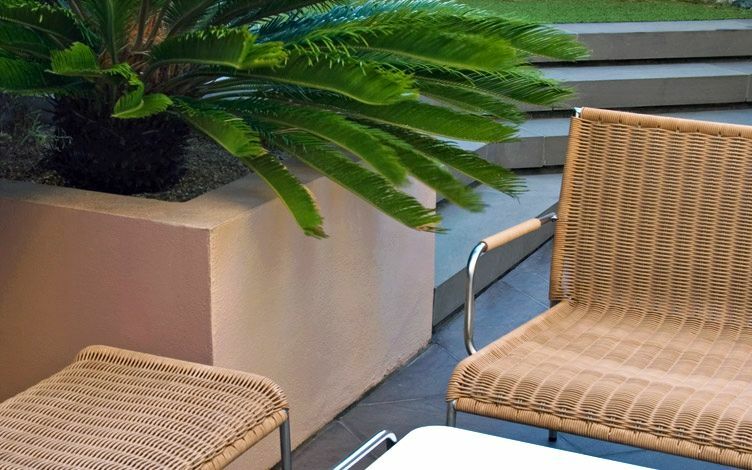 Since Dorset is far warmer than London, the slow-growing Sago palm adapted well in this courtyard microclimate, where summer temperatures soar into coastal sultriness. 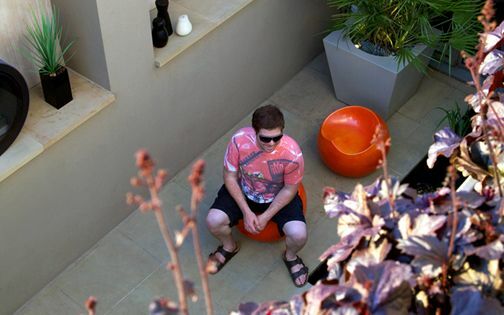 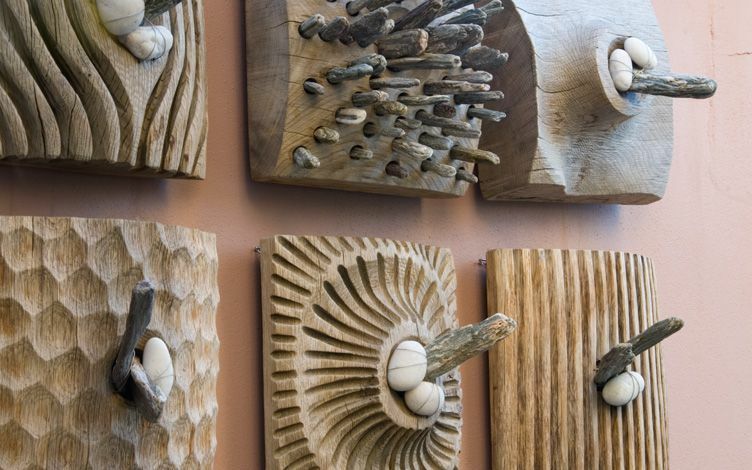 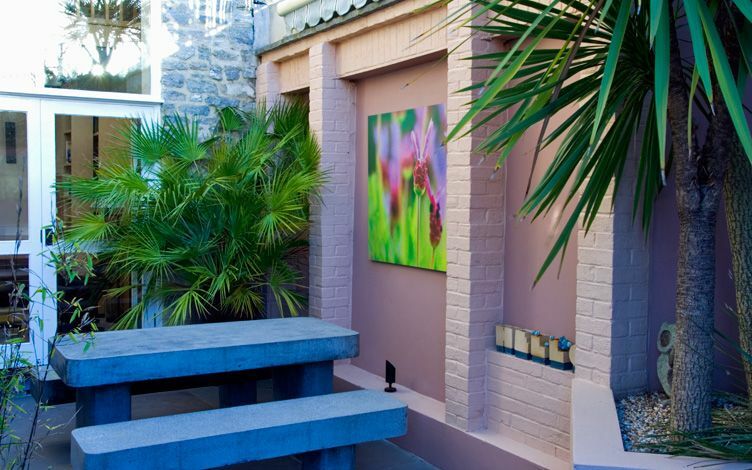 The curved aperture rendered wall which defines the courtyard's top corner forms a sculpture display, and while augmented with our client's penchant for eclectic art, the entire courtyard garden was transformed into an outdoor gallery. 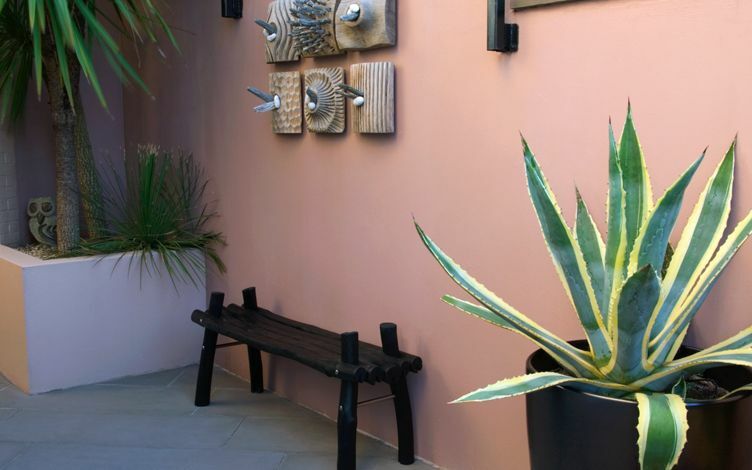 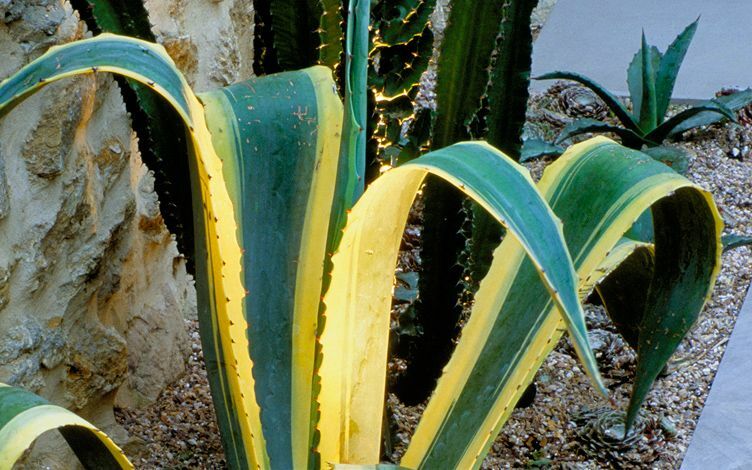 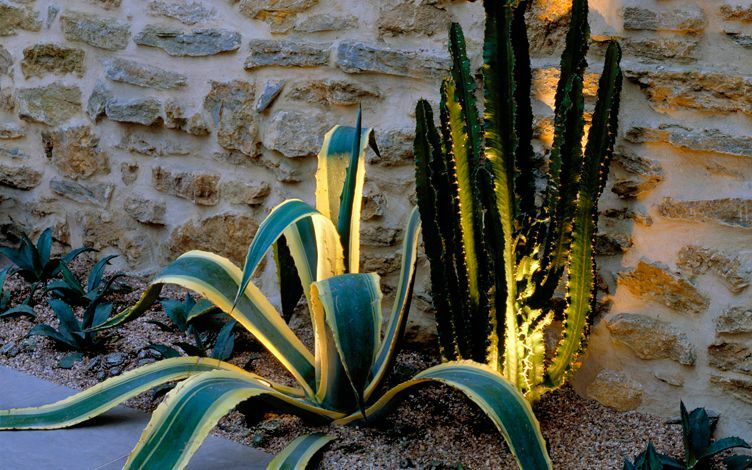 Sculptural Cacti, Agave and Dasylirion from Mexico thrive in this balmy environment, where artefacts dotted around by the client underscore the Dorset seaside ambience, along with our contemporary garden design and landscaping philosophy.